Danielle Costello is a corporate health care attorney. She represents health care providers such as health systems, hospitals, ambulatory surgery centers and practitioners in their business and regulatory matters, counseling clients on corporate regulatory compliance, fraud and abuse and labor and employment matters. Additionally, she advises clients on due diligence reviews, contract projects, and affiliations, mergers and acquisitions. 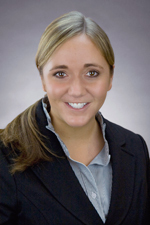 Ms. Costello joined Hinshaw & Culbertson LLP in October 2009. Previously she was a law clerk with the firm in 2007 and a summer associate in 2008. In addition to her other law school achievements, Ms. Costello received the Dean’s Academic Achievement Award. She was a member of Law Review from 2007 to 2009. She served as Managing Editor and Business Editor. "HIPAA Security Breaches and Cyber- Liability," Hinshaw’s Annual Health Care Conference, Lisle, Illinois, November 2012. "Merger and Dissolution Issues for Nonprofits," Northern Illinois Center for Non-Profit Excellence's, Legally Speaking Seminar, Rockford, Illinois, April 2012. "New National Practitioner Guidebook Released," Health Law Alert, August 26, 2015. "Stark Law Violations Stemming from Improper Incentive Compensation Paid to Employed Physicians Result in $85 Million Settlement," Health Law Alert, April 7, 2014. "Alaska Settles HIPAA Security Case for $1.7 Million; HHS Reinforces Need for Adequate Policies and Procedures for the Safeguarding of ePHI," Health Law Alert, July 18, 2012. "DEA Approval Necessary to Act on Recent Amendments to Illinois Law Granting APNs and PAs the Authority to Prescribe Schedule II Controlled Substances," Hinshaw Health Law Alert, February 5, 2010. "CMS and ONC Issue Regulations Defining "Meaningful Use” of EHR Technology," Hinshaw Health Law Alert, January 19, 2010. "The Right to Make Informed Reproductive Health Care Decisions Regardless of Age: Maintaining the Focus on the ‘I’ in ‘I want to be One Less,'" 8 Wis L. Rev. 987 (2008).